So far, the marketing for Castle Rock—the J.J. Abrams-produced Hulu show that’s set in Stephen King’s sinister vision of small-town Maine—has been appropriately eerie and deliberately mysterious. The first episode had its world premiere at San Diego Comic-Con yesterday, and all we can say is: more, please. Sissy Spacek and André Holland play a mother and son with a troubled past. TV shows about tight-knit communities where weird things happen and secrets run deep are extremely familiar at this point, with Twin Peaks, Stranger Things, season one of True Detective, and dozens of others exploring that turf. Castle Rock fits into that mold, but it has something special in that it’s based on the voluminous writings of Stephen King, though not one story in particular. There are offhand references that wink to alert fans, and familiar settings beyond the general gloomy, economically downtrodden milieu of Castle Rock itself, including Shawshank prison. Most importantly, though, there’s that familiar, inescapable King vibe of the Bad Place—where terrible and unexplainable things just seem to happen, as reliably as snow in the winter. That doesn’t mean that everyone in Castle Rock is a bad person—or, at least, they don’t mean to be. The show’s focal point is Henry Deaver (André Holland, who manages to craft a character that you want to root for even though you don’t necessarily trust him). He’s a lawyer who defends death-row inmates in Texas, which means he sees a lot of his clients meet their final end. Though his adoptive mother (Sissy Spacek) still lives in Castle Rock and is exhibiting worrying signs of dementia, Henry’s been gone for years, and you can’t really blame him—though the town has gotten very good at turning a blind eye to a lot of bad business over the years, everyone still blames Henry for a mysterious tragedy that happened nearly 30 years prior. Henry claims not to remember what happened, but he’s still an outcast in his hometown, where he’s become a local legend. Noel Fisher plays a guard at good ol’ Shawshank. Henry’s story anchors Castle Rock, but there’s another major plot thread that he’s a part of—and who knows, it may yet end up tying into his past. 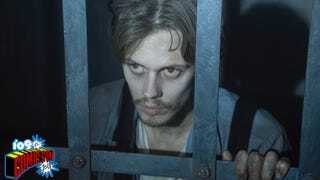 It concerns a very odd Shawshank prisoner played by Bill Skarsgård. The hollow-eyed Skarsgård is just one of several actors here (including Spacek, flawless in 1976's Carrie) that’s already appeared in a King adaptation, a subtext that cleverly enhances the “everything is connected” narrative that Castle Rock seems to be constructing. But given the raging popularity of It and Skarsgård’s unforgettable turn as Pennywise, his casting has added heft here. We’re already uneasy about the guy, even before he appears onscreen. But like we said, we’re not here to give too much plot away. All you need to know is that the first episode sets up several mysteries, introduces us to some unusual characters (including some very intriguing people played by Terry O’Quinn, Scott Glenn, and Melanie Lynskey), shows us some godawful things, and builds up major atmosphere—the kind of spine-tingling dread and irresistible suspense that will leave you fiending to see what happens next. Castle Rock’s first three episodes hit Hulu on July 25.